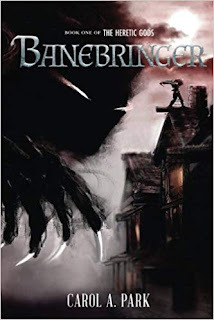 Returning to TBRindr, I settled on Banebringer, the first in what looked like a fairly grimdark series, with some cool magic and monsters. I've been on a bit of a roll with my grim books, so I was quite looking forward to this one. In the world of the Heretic Gods, the eponymous Banebringers are reviled as worshippers of heretical gods and summoners of the predatory monsters known as Bloodbane. Vaughn, an unwilling Banebringer of noble birth, is trying to have a low key life but finds himself hunted by his own father, obsessed with maintaining the reputation and influence of their family name. Not able to bring himself to kill his father, he appeals to the assassin Sweetblade, hoping that she might be able to do what he can't. Sweetblade has her own reasons for wanting Vaughn's father dead, but the risk of angering the power of the Conclave that he works for, and her own instant dislike of Vaughn might see the Banebringer sharing the same fate as his father. There is a lot to like about Banebringer, but the two things that I'm going to focus on for this review are the magic system and the main characters. Magic in this world is primarily a Banebringer trait, which is activated by using up aether in their blood. Depending what kind of Banebringer the character is, this then activates their particular special powers, which range from invisibility to ice powers. And if a Banebringer is killed, it rips a hole in reality and summons a horrifying monster called a Bloodbane. So far so good. The thing that I really love about the magic system though, is that it develops as the plot goes along. A lot of fantasy series would probably look at that magic system and decide that it's good enough as is, but because a large chunk of the novel involves other Banebringers who are actively researching into how and why their powers work, the magic system continues to grow more complex and layered. I'd continue the series just to find out how far it can go. The other thing that I particularly liked was the relationship between Vaughn and the assassin Sweetblade, revealed to be a woman called Ivana. The fact that they clash is hardly surprising, considering that Ivana is aloof and has a particular hatred of being propositioned, while Vaughn is an incurable flirt content to never settle for one woman. And of course, opposites attract, that I was expecting. What I wasn't expecting was the depth of feeling and consideration that each of them get over their separate character arcs, and certainly not the direction that it took in the end. And rather than feel cheated that my expectations weren't met, I'm eager to find out how their relationship progresses as the series continues because it still felt really natural and well-explored. The only thing that I will say is that the rest of the world can feel a bit vague at times, with names of regions mentioned in passing, only to not be revisited, or certain racial traits skimmed over. Like I'm pretty sure that Ivana is meant to be black, but only because she briefly compares her appearance to someone else, and even then that's only a few chapters from the end of the book.